NEW YORK - This isn't even that much fun anymore. Burying the 2008 Yankees has become too darn easy - like practicing layups on an 8-foot rim or beating a 4-year-old at checkers. If you are a Yankee in 2008, the Red Sox are your daddy. The Sox pummeled the once-proud Bombers again last night. This time it was double-pumping Paul Byrd dazzling the billionaires' club with his 87-mile-per-hour heaters and old-timey dropballs in an 11-3 rout. Dustin Pedroia provided the exclamation point with a grand slam in Boston's seven-run eighth. Jack Nicholson was on hand to watch the blood drain out of the Yankees' season. Who says he can't handle the truth? The Yankees came into this series hoping for a sweep, announcing they needed at least two out of three. When they dropped the opener Tuesday, they were forced to put their season into the jittery hands of one Sidney Ponson. It's not a good sign when the only thing standing between you and virtual elimination is Sidney Ponson. The Yankees would have been better served by Sidney Wicks. Or Sydney Greenstreet. The Tub of Goo was gone before the end of the fifth, and the Yankees are gone before the end of August. Ponson is now 3-13 in 22 career starts against Boston. The humanity. Today, the Sox play their final game ever in Yankee Stadium, and they have a chance to drive another nail into the Pinstripe coffin. With 30 games remaining, the Yankees are 10 1/2 games out of first place in the American League East and seven games behind the Sox in the wild-card hunt. "When they put an 'X' next to your name is when you've run out of days," said overwhelmed Yankees manager Joe Girardi. "It's not for lack of effort. We still have baseball left. I've said all along I believe in this team. We've had two games that haven't went the way we wanted it to." Girardi could be on a short leash. Hank Steinbrenner, son of George, was in the building last night (a rare appearance) and stayed until the bitter end. He's not getting much bang for his $200 million payroll. If they hadn't inflicted so much pain on New England, it would be tempting to feel sorry for these Yankees. They are going to finish out of the playoffs for the first time in 14 years. They are going to close out the House That Ruth Built in a regular-season night game against the Orioles. Mr. October will be asked to turn out the lights Sept. 21. Yankee Stadium will be dark when the playoffs commence at the hardball aquarium in St. Petersburg, Fla.
Oh, and those New York kids moving into Boston College this weekend can prepare for a lot of verbal abuse from their New England brothers and sisters. Many Yankee fans fled last night's rout after the Sox broke it open in the eighth, but there were still enough on hand to muster a strong Bronx cheer for Mr. Alex Rodriguez in the bottom of the inning. The Pinstripe Piñata ripped a couple of doubles, but he's still blamed for everything but the price of gasoline in Yankeeland, and he will go into another winter wondering what it's like to play in the World Series. 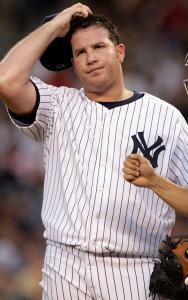 Mike Timlin - who has morphed into the Greg Kite of the Red Sox - was on the mound when A-Rod came to bat in the eighth. It tells you something when Terry Francona is comfortable with Timlin in the eighth inning of a game at Yankee Stadium. Naturally, Timlin mowed down the Yankees in order in the eighth, getting A-Rod on a listless grounder to third. They kept playing videos of former Yankee greatness on the big board in the late innings, but this was truly pathetic. The place was practically empty when Jason Giambi homered off Timlin to open the ninth. It made some of us eager to get our hands on early editions of New York's tabloids. Should be ugly. "It's not where you want to be, but no hole is too deep to climb out of," said Girardi. "We have to come out and be perfect [today]," said Johnny Damon, who knows a thing or two about miraculous recoveries. "We still have 30 games to go. We're a much better team than we've shown all year." The Red Sox and Yankees have been playing one another at Yankee Stadium since 1923. Including playoffs, New York owns a 489-289-4 record against the Sox in this sacred house. But it ends today and it's ending badly for the Yankees. Here in the final days, the Red Sox have some sweet revenge.